Big Hungry Shelby: Dispatch from Charleston: The Best Cornbread. EVER. Dispatch from Charleston: The Best Cornbread. EVER. I was lucky to be invited to participate in a conference at Boeing South Carolina earlier this month which afforded me nearly a week in Charleston, The Holy City of the South. I’ve always wanted to visit, and despite nearly annual trips to the Outer Banks in childhood and two college years in southern North Carolina, I’d never yet had that chance. Naturally, being a fan of all foods southern, I’d read about the culinary renaissance there and the good work being done by Chef Sean Brock in this capital of Spanish moss and gentility. Our conference was centered at a spectacular hotel – The Charleston Place Hotel. I have no idea how much rooms cost there, but do choose it if it fits in your budget. It is at the center of everything you’ll want to see and do, and the Louis Vuitton store right in the hotel was recently visited by Blake Lively and Ryan Reynolds following their Charleston nuptials. The Spa at Charleston Place was rated very highly, so I gave it a try for a lemongrass and green tea body scrub the day of my arrival, and was highly impressed at the quality of 30 minute massage included in the treatment. Usually, massages tacked on to body treatments are perfunctory, but my esthetician diagnosed my needs and gave me a true deep tissue massage, targeting my travel-weary muscles and providing a truly luxurious experience. Plus: turn down service and chocolates on the pillow! Your home base at Charleston Place will afford you a centralized jumping off point to enjoy both the glamorous potential pocketbook trouble of King St. shopping, the touristy glee of the Central Market’s Gullah-inspired souvenirs, and tons of fabulous restaurants. 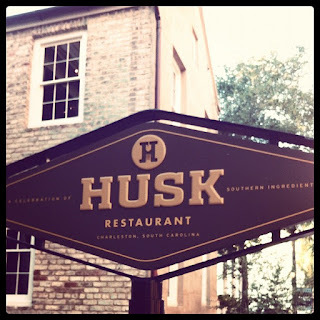 One such eatery, named Best New Restaurant by Southern Living in 2011, is Husk, which Boss K and I ate at night one of our Charleston trip. 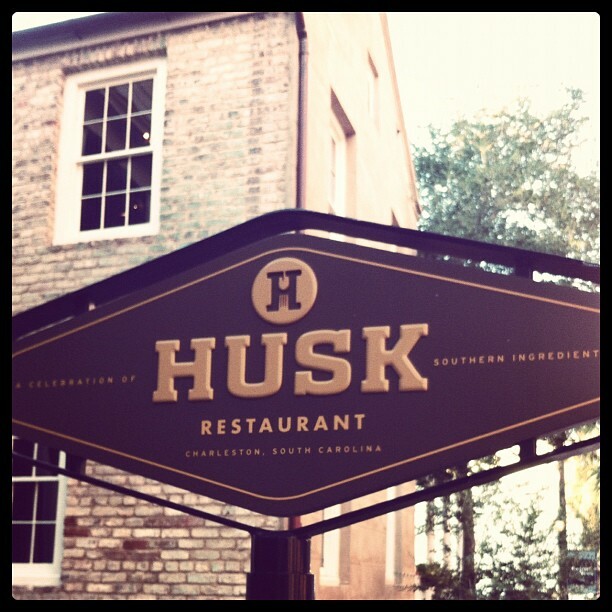 Husk has a different menu every single meal service, with all foods sourced south of the Mason Dixon line. Chef Brock has an enormous respect for local ingredients, taking the provenance of his meats and grains as seriously as French chefs take wine and cheese. What this means is, while I’m going to tell you how great my meal was there, your meal when you visit will invariably be much different. What doesn’t change is the cocktail menu, and I can tell that the Triple Lindy I had, with rose-infused tequila, tonic and cayenne/sugar/salt rim, was clean, crispy and refreshing, which is what you need when you order an appetizer consisting of battered and deep fried chicken skins. I’m pretty sure the idea of fried chicken skin as a stand-alone dish is gross to most people. In the abstract, I get that. But think about Thanksgiving, when you crowd around your dad as the poor man tries to carve the bird, absconding with crispy, salty sheaths of golden poultry skin. You know you’ve done it! An entire plate of these was certainly more than decadent, but the piquant peach-honey dipping sauce and my own bottle of house-made hot sauce somehow transformed this usually furtively-eaten treat into a cohesive dish I wasn’t ashamed to eat loud-and-proud, in public. The skins themselves, fried up golden, had a little more give and heft than the very crispiest of turkey skin, a light-as-air crust, and that salty/fatty balance sought after by the world’s most extravagant gluttons. I couldn’t eat the entire plate, but I wanted to. The must-order, don’t-miss, don’t even think about messing with my guidance here item at Husk, and one they actually have every day, is a side of Benton’s bacon corn bread for the table. I’m serious, people. Do not blow off this advice. Get this corn bread, and then name your first-born after me. Benton’s is the fabled smokehouse of the South, home of the smokiest bacon in the land, bred from heritage piggies and lovingly cured by gastronomic superhero Allan Benton. In this cornbread, the bits of the hickory-smoked pork belly are rendered in a small cast-iron skillet, and then the corn bread batter is poured right in over top, so that the bacon grease provides the lube for the pan. Because Benton’s bacon is so smoky, the entire affair gets that hickory undertone, with a sea-salt-sprinkled top and crispy bottom. When you bite into this heavenly lavishness, the bacon fat coats your mouth in the best possible way, and then the corn meal batter takes over to balance the porcine content perfectly. This really is a Southern classic made into a masterpiece. Incidentally, you can order bacon directly off Benton’s website. I’ve done it; it’s a GREAT idea and hilarious to receive a box of bacon via UPS. My entrée was a pork chop, accompanied by cider-braised cabbage, apples and turnips. Overall, the dish balanced bitter and sweet really well, with the turnips providing the counterpoint to the cider, cabbage and apples. The chop was caramelized outside, and cooked medium inside, which left the texture absolutely luscious. This dish was fall on a plate, which may have been incongruous with the high 90s temps outside, but was satisfying nonetheless. The cider-based sauce on the plate was lick-worthy, and I was so glad that attention had been paid to an appropriate amount of salt and pepper on the meat – under-seasoning is one of the biggest differentiators between high-end and run of the mill dining, I think. The setting for all this fine food is a wide-porched, classic Charleston home, renovated inside to be modern and casual. K and I wore business attire, but jeans would be acceptable here, if you funked them up with cool jewelry and nice shoes. Be aware, you never know when you’re going to run into Faith Hill or Tiger Woods in Charleston, so you kind of want to look sharp. We gave Husk an eight on the BHS scale, a score only slightly negatively affected by my less-than-stellar buttermilk panna cotta dessert, which was rather insipid, unlike the rest of this sumptuous meal. Overall, this is a spot worthy of the hype. The food is thoughtful, measured, outrageous, but still anchored in history, with a real sense of both time and place. And the cornbread is bangin’. Another worthy stop on the very same street is Poogan’s Porch, a Charleston mainstay since 1976 and another celebrity haunt. And by haunt, I mean this place is haunted, although K and I enjoyed a somewhat more casual meal there unmolested by apparitions. We began with the fried green tomatoes, which is one of my favorite things, though it was tough not to order the pimento cheese fritters, given my recent penchant for that product. The batter on these slightly bitter babies was everything – crunchy and just greasy enough to let you know you were eating something delightfully naughty, and the pecan-crusted goat cheese alongside was a brilliant, tangy, earthy accompaniment. This was one of those doomed meals where my eyes were bigger than my stomach and I couldn’t really do my own entrée justice as far as eating it, but I tried my damndest. The pork 3 ways was most of my favorite things all on one plate: pulled pork, pork belly and ham-studded macaroni and cheese. Every little thing on that plate was outstanding – the macaroni was al dente, the gouda sauce was sharp, smoky, and had definite personality, and the pork belly was ridiculously rich, salty but not too much, and savory with not-too-sweet BBQ sauce deliciousness. The pulled pork could have had more texture, but I’m really splitting hairs, here; this was fine food. K had the shrimp and grits, which I thought were fantastic in a spicy, hearty, homey way. She, however, wished in the end she’d ordered the fried chicken. And THAT is why you need to go to Charleston yourself and sample these yummies – because we all have different tastes, and just today I was reading a comment on Facebook from a dear friend who thinks chefs are relying too heavily on bacon as a crutch. This is blasphemous sacrilege to me, of course, but apparently, not everyone is as obsessed with salted, cured, pork products as I am. 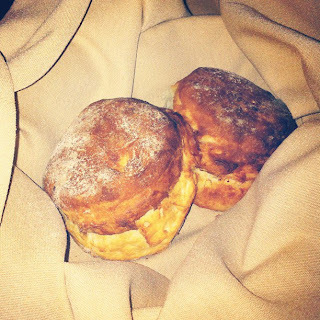 Oh, and try Poogan’s sweet, buttery, flaky, tender biscuits. Riiight, I forgot I ate those. That might help explain why I was so full come entrée time. Anyhoodle, while Poogan’s might not be setting the world on fire like Husk and Brock’s other baby, McCrady’s, it is classic comfort food translated in a uniquely Carolinian way, and totally worth one of your Charleston evenings. Next week, I’ll tie up Charleston in a pretty little package for you with a breakfast that blew my mind, and some fun new friends from Abu Dhabi. Hold on to your hats and stay tuned, because it was fabulous. My hunger is big; my personality is bigger!